Just picked up this 2002 Boxster S from a very good friend in September. Drove it from Washington to Minnesota along a great driving run through Puget Sound, the north Cascades, Glacier NP and other points of Montana before hitting the interstate through ND and on into home. WHAT A CAR! I've been riding BMW motorcycles for my summer driving, but it has gotten just too crazy on the road with cagers not paying any attention to motorcycle drivers. I thought I'd really miss driving a bike, however one trip on the Road to the Sun through Glacier NP convinced me I will not miss riding the K1600GT! 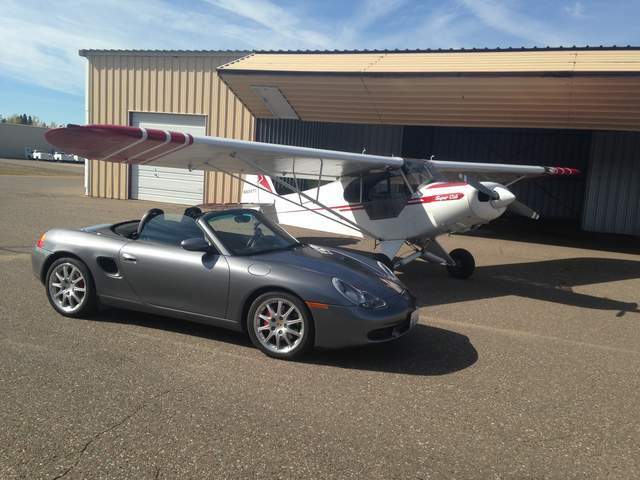 Here's the new Boxster S parked next to my recently restored '54 Piper Super Cub. Looks like I have the Air and Land now covered. Just have to find something to cover the Sea (for use in the 10,000 + lakes here to complete the trio. break out another thousand ! Yes! Great car by the way. With that much garage time, make sure you get your ims bearing sorted. If you've done your research on these cars, the 2001-2004 m96 is most susceptible to failure and it's more prevalent with the garage queen cars. Not trying to worry you, just looking out for you. Car looks fantastic. 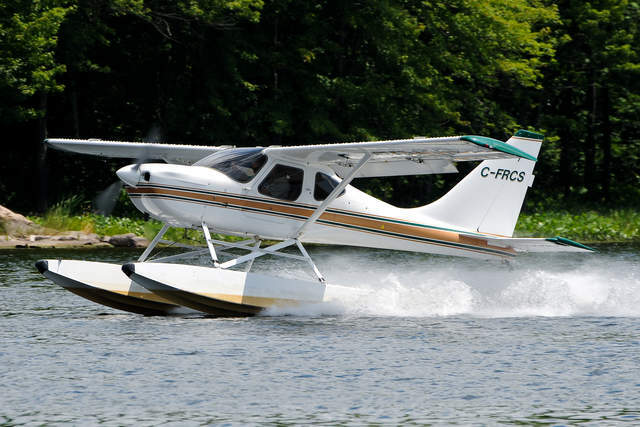 Aerocet 2200's would be a perfect addition to your Cub! I have them on my Glastar they are awesome floats! Nice pickup! From WA, too...shame I didn't know about that car when I bought mine (I live in Seattle). Mine looks much like yours except it's Meridian Silver Metallic. Given the very low mileage, it is worth having the IMS and RMS looked at. Low mileage cars seem to be at greater risk for IMS bearing failure. I had mine upgraded soon after I purchased it for peace of mind. It came from Edmonds! And the IMS was done just before I brought it home. Along with new tires and the belts changed. He also had a 1984 911SC (I think that's the model) with only 40k miles on it he sold to another mutual friend of ours. I love the Glastars! I almost got into building one myself. Even went to Arlington to test fly one. If it doesn't have a tail wheel, I really don't like flying it much. They work great on floats and here in northern MN, we are ice free for at least 30 days a year. GRRRRR! The Cub was the first plane I was ever paid to fly and since I'm retired, figured it would be a great plane to have in my last years of flying! And I can land in my back yard when I want to. If I put a larger door on the pole barn, I could keep it there. Too bad winter is here. I hated parking the 986 S just because it was so much fun to drive. Even if only going to the airport to fly the Cub. Last edited by Chopperguy; 12-08-2015 at 05:55 PM. 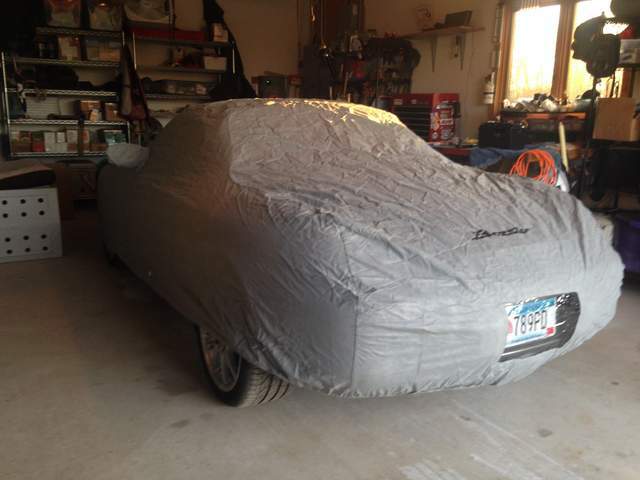 Welcome aboard the best Boxster forum on the internet. You are going to love the car. It is a pain having to store it for 4 or 5 months, I'm in Manitoba so I know the routine. Treat the car right and you will have a great time. Look into joining the PCA. Panorama magazine alone is worth the membership fee. If it doesn't have a tail wheel, I really don't like flying it much. I hear you! Mine is a taildragger when she is not on floats.